The Recording Studio is fitted with equipment for audio and video recording. It is available for faculty and students who would like to use it for a Yale class or class-related activities. A Poorvu Center staff member will be available to demonstrate how to use the technology in the room before the first class session or class assignment. Microphone: Yeti Blue USB Microphone which helps create impeccable, studio-quality recordings with intuitive and easy steps. The four different pattern modes provide flexibility to record a bevy of diverse recordings like podcast, interviews, audio for videos, vocals, etc. Video Camera: Panasonic 4K is ideal for professional video recordings. It is on a tripod with adjustable height. Professional Lighting: With 2 Spotlight floor lamps and multiple adjustable ceiling lights to provide ideal light for diverse studio recordings. Studio Acoustics: Soundproofing acoustic foam is built in the side walls. It reduces echoes and background noise by absorbing the reverberations sound can make by bouncing off the walls. Professional Background for video recording. Ceiling Mounted Projector with a drop-down screen. Mac Mini Computer with Audacity software for editing. 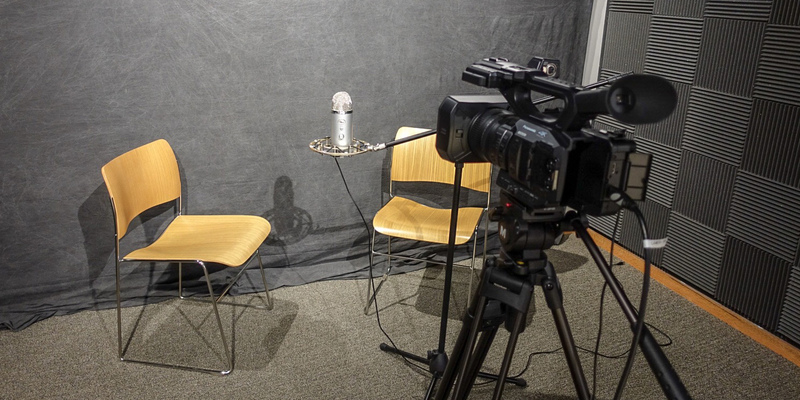 Request for the Recording Studio can be made by emailing medialibrary@yale.edu with your preferred times.